Gavlak is pleased to present We’re All Made of Star Stuff, an exhibition of new work by Jose Alvarez. 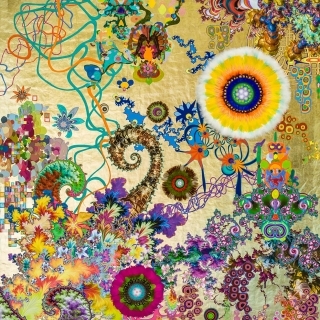 Working in a variety of media, including works on paper, paintings, video, collage, crystal paintings, and digital murals, Alvarez creates dazzling, brightly-colored works that explore ideas as vast as truth, altered-states, the natural world, outer space, and the nature of consciousness. 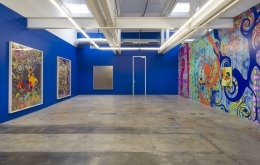 Over the course of the past two decades, Alvarez has developed a lexicon of forms that he uses to create visually and conceptually complex works that mine his own interior landscape in an effort to connect to the basic human experience. Alvarez’s artistic career began with an elaborate performance in which he toured Australia with his now-spouse, the magician James Randi, pretending to channel Carlos, a 2,000 year-old spirit. Posing as a seer, Alvarez sought to explore the notion of both inhabiting and espousing belief by publicly debunking the notions of soothsayers and charlatans. The performances were as well captured through a series of videos that were ultimately included in the 2002 Whitney Biennial.The exhibition’s title references the philosophy of astronomer Carl Sagan, who featured Jose’s performance in his book The Demon Haunted World: Science as a Candle In the Dark. Among the works on view will be the “Taking Flight” series, a collection of small-scale paintings on linen, featuring details drawn from his larger works. 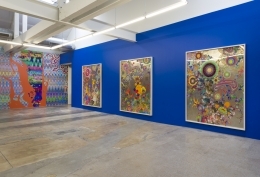 Here, blown-up, explored as individual concepts, the abstract images appear as near-figurative characters from a science fiction story, composed of brightly colored forms. Also on view will be “Fearless, Limitless and Free,” a triptych that is the largest piece Alvarez has ever created on mica. The work features vibrant, geometric shapes, organic forms, and abstracted elements and patterns, drawn from memories, dreams, and impressions, painted over glimmering panels of mica. As Alvarez notes, while much contemporary art today delves into the horrors of modern- day life, in his work, he chooses instead to explore the compassion, generosity, bravery, and immense creativity that exists in the world as well. 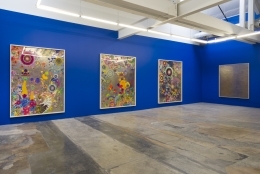 His works seek to connect with a basic thread of humanity that runs through each of us, and to create a place where people can be transformed and restored through grappling with the conceptual, aesthetic and power of art. Jose Alvarez was born in Venezuela and lives and works in South Florida. 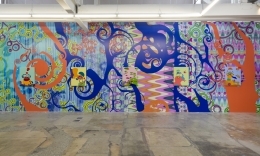 Alvarez has been the subject of solo exhibitions at The Kitchen, New York, and the Art and Culture Center of Hollywood, Florida. 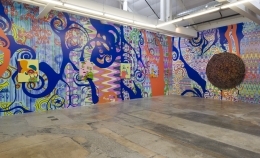 He has also been included in notable group exhibitions including Cosmic Wonder, Yerba Buena Center for the Arts, San Francisco; Optical and Visionary Art Since the 1960s, the San Antonio Museum of Art; Beauty Reigns, McNay Museum, San Antonio, Texas, and Akron Museum, Akron Ohio; and Altered States, The Norton Museum of Art, West Palm Beach. Alvarez attended the School of Visual Arts from 1992 to 1995. In 2014, a documentary film, An Honest Liar, was released to international acclaim, telling the story of the artist and his spouse. For more information concerning the exhibition, please contact Tabor Story at tabor@gavlakgallery.com, or (323) 467-5700.